Damage is seen in the Florida Panhandle after Hurricane Michael makes landfall. 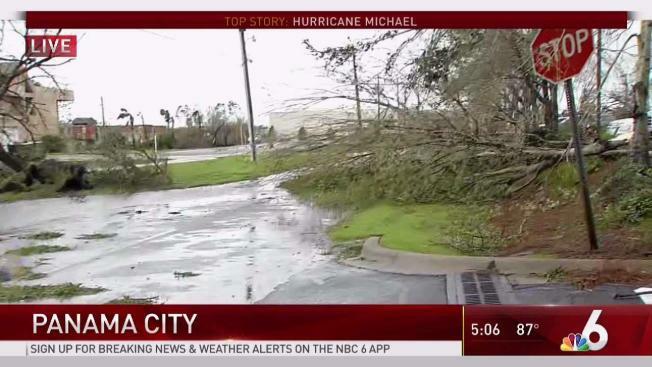 NBC 6's Laura Rodriguez reports from Panama City. Timothy Thomas isn't budging from his home on Ocean View Drive, even though it's directly in the path of Hurricane Michael. Thomas, a 50-year-old air conditioning repairman, plans to defy an evacuation order and ride out the monster storm in an apartment that's just a few hundred yards from the beach and even closer to the tea-colored Grand Lagoon, which will rise as the massive storm pushes ocean water toward the coast of the Florida Panhandle on Wednesday. An Illinois native with a beard, long hair and a streak of independence, Thomas hasn't been through a major hurricane before; he's only lived in Panama City Beach about seven years. A neighbor with far more storm experience is evacuating to higher ground. But police aren't being pushy about enforcing the order, and Thomas figures he, his wife and their puppy will be OK since they live in a second-floor apartment. It's more than 10 feet off the ground, after all, and forecasters say the water in his area isn't supposed to rise that much. "If it does I guess we'll be swimming," he said Tuesday evening as the sky darkened overhead. Thomas isn't alone; other residents along his street also plan to take on Michael head-on, even though authorities have told about 120,000 residents of Bay County to leave. Thomas' first-floor neighbors also plan to stay, and they're welcome upstairs if the water gets too high, Thomas said. So are his next-door neighbors and their dog. As Thomas spoke, a hurricane party was going on less than 2 miles away at Buster's Beer and Bait, a dive bar popular both with locals and tourists who overwhelm the region during the summer. With Michael percolating out in the Gulf of Mexico, dozens of people gathered outside Buster's as small palm trees swayed in the breeze nearby. Other places were shut down and locked up. The windows were covered with metal hurricane shutters at Pineapple Willie's, a popular beachfront restaurant, and sandbags blocked the entrance to a Wells Fargo bank. Plywood covered the front at Shrimp City, a small seafood market. Dwight Williams, who lives across the street from Thomas, wasn't taking any chances — he and his wife were packing to evacuate. They plan to stay with friends in DeFuniak Springs, a Panhandle town about 30 miles inland. Their single-story home is built to withstand winds blowing up to 130 mph, Williams said, but rising water is scary. "What worries me is the storm surge," said Williams, who has lived on the street for about 24 years.